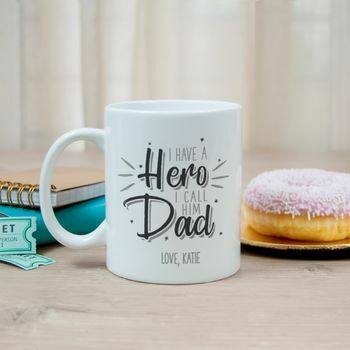 A gorgeous personalised 'I have a hero, I call him Dad' typography ceramic mug. This beautiful 'I have a hero, I call him Dad' mug is the perfect gift for Father's Day, Birthdays or as a Christmas gift. The mug is printed the same on both sides of the mug.